It made sense to start my Sugar/NaCl investigation by porting the same demo application to Native Client. 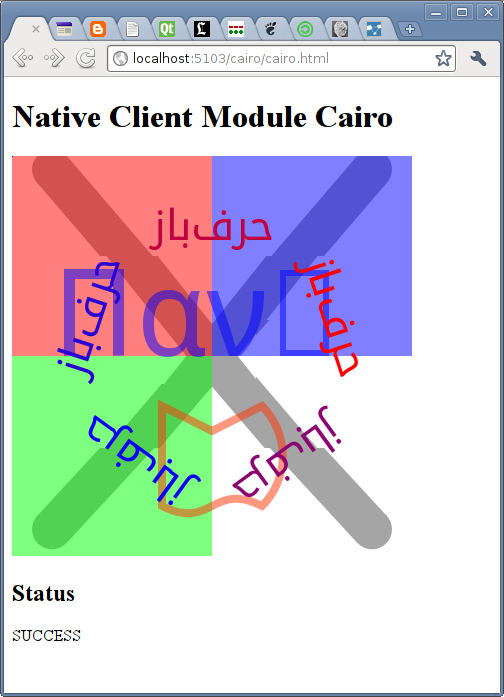 The same stack of ported libraries was involved, although it was easy to include more functionality in the Native Client ports, including threading and PNG/PS/PDF support in cairo. The source code is a fork from the upstream naclports project, and the process was generally much cleaner. (But see my previous post for some caveats regarding naclports.) If you're using Chrome 10 or 11, you can run the demo in your browser (follow the instructions on that page). The Wesnoth team has a parallel project which ported some of these libraries as well, but not in an upstreamable manner. 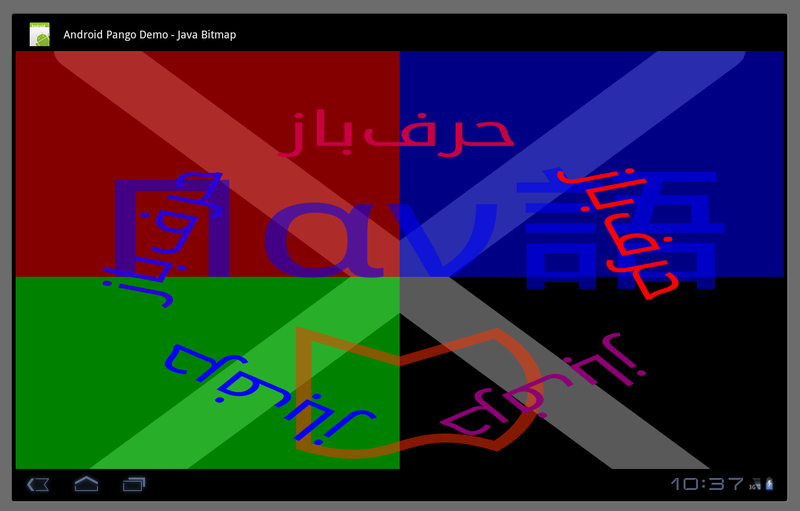 The demo app uses cairo to draw the background, an animated X, and some basic text in the center; it uses Pango's advanced international text support to draw properly-shaped Persian text in a circle around it. The center text is the "proper" bilingual Greek/Japanese written form of "pango"; the text around the edges is the Persian name of the internationalization library, "harfbuzz". Note that the Persian text is written right-to-left—and that I didn't put a full CJK font in the NaCl app, so the Japanese "go" character is missing. The Android port rebuilds the font cache at each startup, so it loads rather slowly; the NaCl port contains a prebuilt font cache so it starts more quickly. Much of the GNOME/POSIX library stack assumes access to a filesystem tree and does file-based configuration. In our demo application, fontconfig was the most culpable party: it wanted to load a configuration file describing font locations and naming, then to load the fonts themselves from the file system, and finally to write a cache file describing what it found back to the file system. Most ported software is going to want similar access—even if you store the user's own documents in a Journal, software still expects to find configuration, caches, and other data in a filesystem. Android provides the POSIX filesystem APIs, but the filesystem an app can touch is segmented and sandboxed. As discussed previously, Android's Opaque Binary Blob feature may allow you to create a app-specific filesystem, but this doesn't let you share (for example) fonts and font configuration between activities. NaCl might eventually provide a similar unshared mechanism based on the HTML5 AppCache. More problematic are the networking APIs. Here Android provides a pretty standard socket library, while Native Client provides nothing at all. Using a browser-based implementation, as for the file APIs, will work fine for HTTP, WebSockets and even P2P via the HTML5 P2P APIs. But it's not clear that (for example) glib's elaborate asynchronous DNS name resolver implementation can (or should!) be implemented in a NaCl port. In the end, the porting effort and abstraction shifts needed for Native Client and Android are roughly comparable. I expect Native Client will hold a strong edge in allowing close integration with web standards and web technologies. Android will probably continue to hold an edge in third-party application support and platform maturity. That's really a great job. I wanna port pango and cairo to android too. However none of static or shared libraries was built. The error is "cannot find -lc". After I appended "-L$(NDK)/platforms/android-9/arch-arm/usr/lib" to HOSTLDFLAGS, the error is "libdl.so not found". My built environment is Ubuntu 11.10. I'm not as expert as you are, so any help is appreciated. Thank you.